This month's Loaded Dog concert features Warren Fahey and Tom Hanson. Warren Fahey started performing in mid 1960s & has never stopped despite the fact that he refers to himself as 'Australia's best-known shower singer'. He has a unique repertoire of bush songs, early ballads, city ditties & associated folklore including poetry, drinking toasts & parodies. As a singer, Warren has performed 'in just about every place in Australia'. With his pioneering ensemble, The Larrikins, he toured for Musica Viva & the Arts Council circuit for over 20 years. Warren is currently collecting folklore for a series of books he is writing. 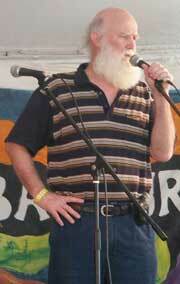 Tom Hanson, the singing megaphone, has been seen and heard around the Sydney Folk scene for well over 25 years. He enjoys yarning, reciting humorous poetry and singing - particularly chorus songs. Tom will be doing one of his rare, rousing chorus song filled, solo performances. He put the roar in The Roaring Forties with whom he has been singing since their inception in 1988. Tom has also performed backup on various albums for Paul Hemphill, Margaret Walters and Dave Alexander. The Loaded Dog takes place in the upstairs hall of the Annandale Neighbourhood Centre in Johnstone Street - the former Annandale Town Hall. Doors open 7:40 - show starts promptly at 8:00 with floor acts. For more info contact Sandra Nixon (02) 9358 4886. Coming up at the Dog . . .